Long gone are the master filmmaker’s stylistic signatures: his meticulous eye for detail in the biggest monster and tiniest fairy, his deft tonal balance of the weird and the whimsical, and—above all else—an obvious affection for his creatures, both good and evil. Instead, under the watch of director Neil Marshall, we get empty bombast and a million bloody ways to rip a body to pieces, too few of which are inventive. Marshall takes over for del Toro, who directed the original 2004 “Hellboy” and its sequel, 2008’s “Hellboy II: The Golden Army,” films that were an ideal pairing of director and star with Ron Perlman as the wisecracking, half-demon superhero. And while it would be a daunting task for anyone to follow in those esteemed footsteps, Marshall—who mostly has horror films and television credits to his name, including “Game of Thrones”—allowed his take on the character to spiral wildly out of control. Granted, that’s partly the point. The script from Andrew Cosby, based on Mike Mignola’s Dark Horse comic series, is cheekily anachronistic and self-aware. It’s also bloated with its many flashbacks and tangents introducing more characters and subplots than anyone could possibly follow. 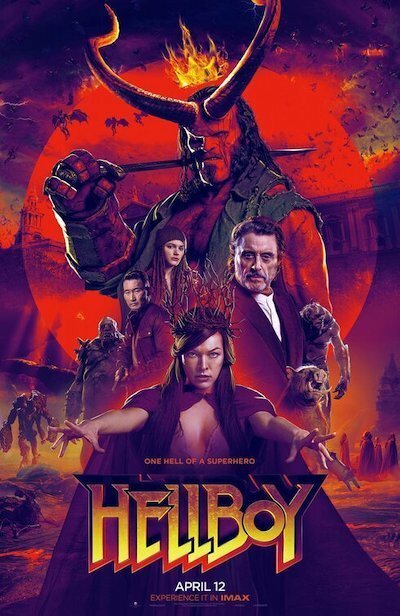 And this “Hellboy” really wallows in every last drop of its R-rating whereas the previous films were PG-13, upping the graphic violence, profanity, and overall gnarliness. It’s the further Deadpool-ization of an already irreverent and inappropriate character, and—for a little while—it’s admittedly kind of a kick. At the center of it all, the endlessly intriguing and appealing David Harbour can only do so much. He more than ably steps into Perlman’s giant boots to play the hulking and hard-drinking Hellboy. It’s good to see the “Stranger Things” star continue to get leading roles after a lifetime of strong supporting character work. Harbour has just the right look, the grizzled attitude, the way with a snappy one-liner. He even gets the opportunity to explore Hellboy’s sensitive side buried deep beneath his beefy, red exterior as the character discovers the truth of who he really is. (Because of course, this “Hellboy” is an origin story. Every comic book hero gets one, and usually more than that.) But increasingly, he’s called upon to contribute little more than sheer brute strength. He’s also stuck with far too many groaners, including one truly terrible pun toward the end that had me saying: “Oh no, no no no,” out loud to the screen. Where to begin in explaining the plot? How about many hundreds of years ago, with King Arthur (yes, that King Arthur) slaying the evil blood queen Nimue (a vampy Milla Jovovich), slicing up her body and placing the pieces in boxes to be hidden across the land. (This is just in the first few minutes, folks.) Cut to the present day, with Hellboy, as a member of the Bureau for Paranormal Research and Defense, eventually having to fight off Nimue as she gets put back together and gathers her powers to wreak havoc on humanity. That is an extremely oversimplified explanation of the plot. So much more happens along the way, but there’s no need to clutter your brains with it. Hellboy would seem like a pretty formidable force unto himself to battle this ancient baddie. Nonetheless, he gets help from Sasha Lane of “American Honey,” doing an iffy British accent as a young clairvoyant; Daniel Dae Kim as a British military operative with a secret; Sophie Okonedo as an aristocratic seer; and Ian McShane as Professor Broom, or as Hellboy calls him, Dad. He also must fight members of a centuries-old elite society; a giant, talking pig man (Stephen Graham); and actual giants. Oh! And Nazis. Because of course there are Nazis. Individually, Harbour might have a humorous moment or two with his co-stars, but decreasingly so as the movie staggers toward its messy, cacophonous end. And it just will … not … end. After an overlong two-hour running time, “Hellboy” suggests optimistically that it’s the start of its own franchise, but it will probably end up stuck in purgatory instead.